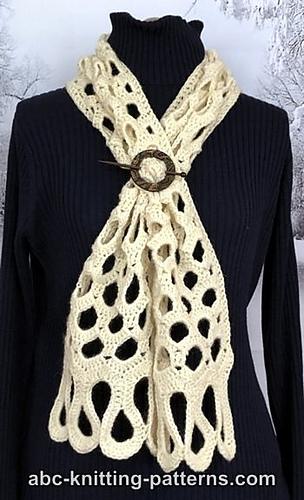 This scarf features a decorative pattern with large honeycomb-style holes. The border is crocheted in two parts. The end of the scarf gets a set of border loops that match the scarf texture, and then a row of dc is crocheted on the long edge for a neat finish. The scarf would be a great accessory for any casual winter outfit. It is warm and cute. This is a very quick crochet project.